It is a reality that most of us shall work with smart machines soon. We cannot ignore this. Let us learn and understand the new world. The sooner we act, the better it would be for all of us. AI is no longer just an abstract concept. It is all over us now. Given below is information on how fast sector is growing.In fact, we are already doing this. We must learn how to work with them rather than be ousted by them. For this, we must learn the new language, that of AI or artificial intelligence. Artificial Intelligence (AI) has often been seen in super-smart humanoid robot form. This is not really what it is today. We need to understand it has grown much beyond this image. The fact, however is that it is actually implemented as behind-the-scenes algorithms. Most importantly, these can process 'big' data to accomplish a range of relatively mundane tasks far more efficiently than humans can. As of now, a very small number of people interact with bipedal robots or take a ride in a driverless car. However, our daily lives are increasingly affected by AI systems that can recognise speech or images, or analyse patterns of online behaviour (to detect credit card fraud or serve up appropriate adverts, for example). 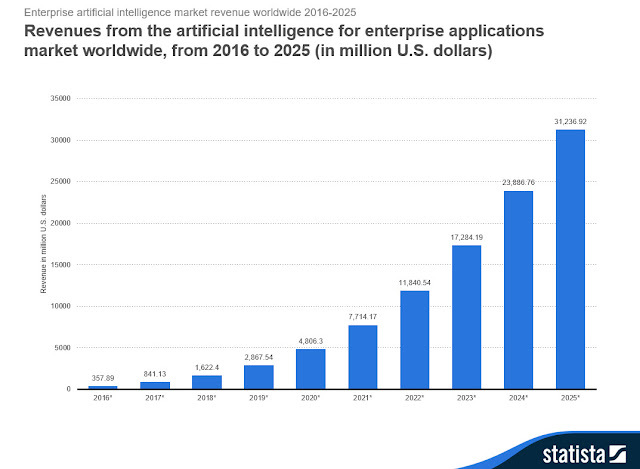 This is why the recent boom in this kind of AI is being spearheaded by internet giants like Google, Microsoft, Amazon, Facebook, Baidu and others. It is also seeing a lot of startup activity. We must know we need better processors for processors for AI. We need to know that solving AI-type problems requires, first and foremost, large amounts of processing power. This is possible even for startups. We teach all startups what to invest in during our courses. After all, the new digital world does make it possible for us to go ahead with even a zero budget. Building a brand that sells is our primary goal! Marketing a business becomes confusing on many occasions when we look out to find the best way to build a brand for us. Here it is important that we understand the digital domain and its pattern. The burden of bringing customers to your business and building roads to your brand can be a scary task. After working with hundreds and thousands of business owners in our various training programs, we found that over 91% business owners find it very difficult to generate regular leads for their business and are hence struggling to grow or in most cases even sustain their business. Therefore, we decided to lay down a one place stop guide of strategies that we can use in the digital world to sky-rocket your business. We first need to understand what or who our assets are in the digital world. Saving is a habit most of us are encouraged to have right from childhood.Some of us were more inclined to saving than others. Even when we grew older, we knew we needed to save in order to invest in our future. A home, for instance, is a dream most of us have had. In the area of entrepreneurship, the asset was usually in a start-up venture. Now, we need to understand the digital world to be able to understand where our assets are. These are naturally quite different from the ones we mentioned earlier. Assets in a digital world are usually hidden and virtual. No one now uses a physical bank passbook. The passbook is now a mobile app where you view your account balances and transfer money from savings to investment accounts. The credit card is now your currency. An online brand is not to be touched but experienced. A brand in the digital world is to be viewed, listened to and shared. Our aim, therefore is to promote this new, democratic world. This is possible only if we are digitally skilled. For this, we need to definitely understand the new language of Artificial Intelligence. If in earlier times, it was the survival of the fittest, now it is survival of the web enabled or digitally skilled. This definitely also includes AI. It does not require too much effort but definitely requires a lot of passion. A passion that never leaves us for this is the world we live in and also the world of the future. Many do not really understand this. Despite websites being with us for a generation a website is often treated like an online brochure. In fact, for many small and medium businesses they are an afterthought. They are even considered an expense. This is the biggest mistake one can do. Most people just design it, set it up and then forget all about it. Just like any presence, it does need to be nurtured. Our website, blog and the online store are your core assets in a digital world. These assets need to be attended to all the time. That can be done easily if we just understand the key processes. We at IDM have helped many people achieve this quite effectively. In fact, we are proud to have enabled many people understand this language. Everyone, right from youngsters to established entrepreneurs have grown further when they are open to learning. After all, growth always happens with openness. Join us to understand this new world.